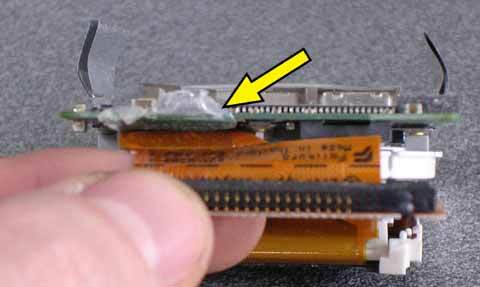 "The LCD diplay is dead (broken and the liquid lies between the PVC strips). Since the breaking, I used it as a hard disk. But, with my home machine, it seems that it is impossible to mount, but this works with my office Mac (both of them are G4 with OS 9.2.1). I am bored in trying to use this piece of hardware. So Basta..."
-> That was a good opportunity to check wat was inside this thing, and to try to solve all, or part of the problems. In fact it does not mount every time I try to use it, sometimes it leaves when transfering data etc. 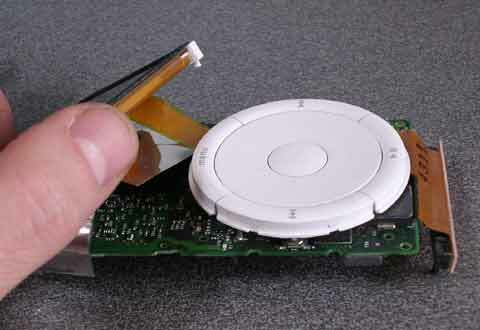 More, this could also be useful to someone who would change the battery of his first generation Ipod. I started to shut the Ipod down. Move the switch button on "locked" position. 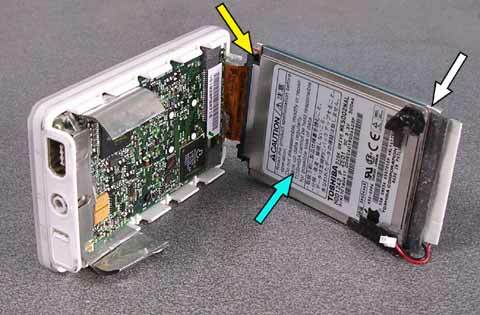 Then, I need to remove the metal case (you can see a part of the PVC latches showed by the yellow arrows on the first picture above). To do that, as usual, I use my mini-lever delicately, opening all of the clips. The Ipod upside down on the table, we must take off the HD/power set after opening the two lips shown by the yellow arrows. 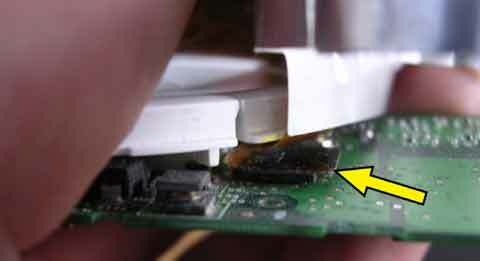 Hold firmly, but gently, as on this side we have to remove the power supply from the chip (blue arrow). 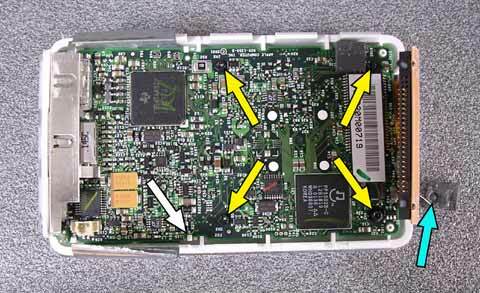 There, we can disconnect the power chip connector, but while still holding firmly and gently the disk/battery set, since in fact, on the other side there is the IDE napper to be also removed. The yellow arrow shows the connector to be removed, the blue one shows the HD and the white one the battery. The battery.HD set is now separeted from the case and the motherboard. 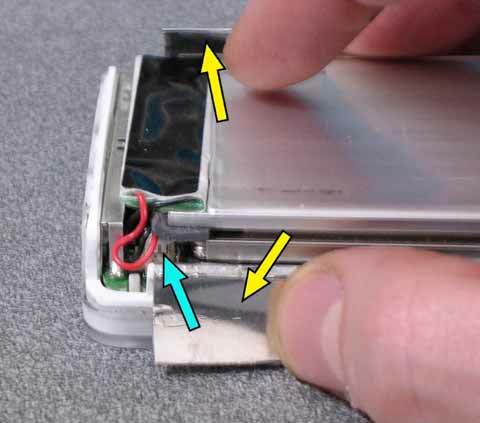 To move the electonic parts out the front of the Ipod , we have to remove the 4 screws (Torx 6) showed by the yellow arrows. 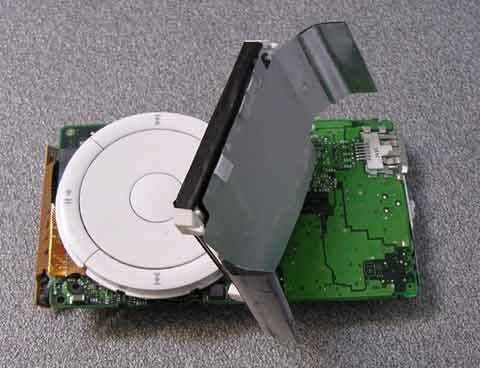 The one on the right below is only visible after removing the silent block that keeps the disc in place, here shown by the blue arrow. 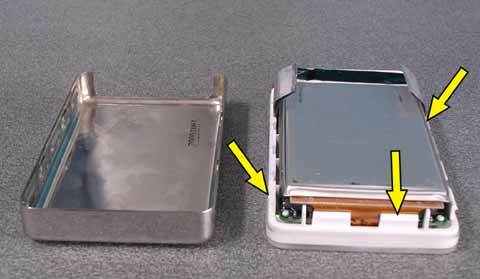 The white arrow shows one of the four latches that keep the LCD display with the motherboard. The separated components and a view of the surely dead LCD display. 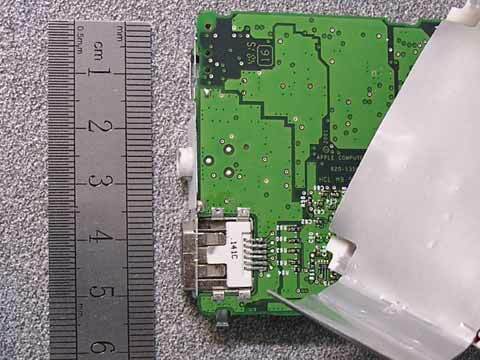 At the connector side, we can see a tear of glue placed there to probably protect the napper from the motherboard chip. The yellow arrow shows one of the 4 latches keeping the disply in place, the blue one shows the connector of the napper to the display. Once the display unscrewed from the motherboard, we have enough room to move the connectors (jack & firewire). 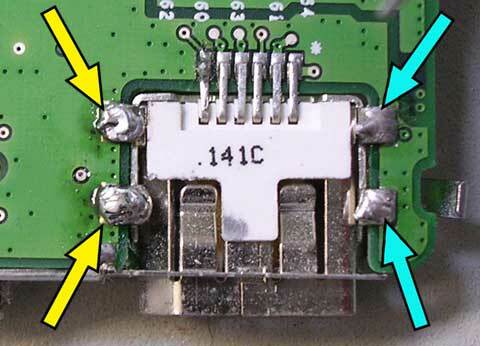 It is recommended to remove the connector showed here by the yellow arrow. I did not do it myself, having no new LCD display to replace and nothing to protect considering the condition of the one here. A view of the firewire connector and solderings. Here we can see an unsold slip. 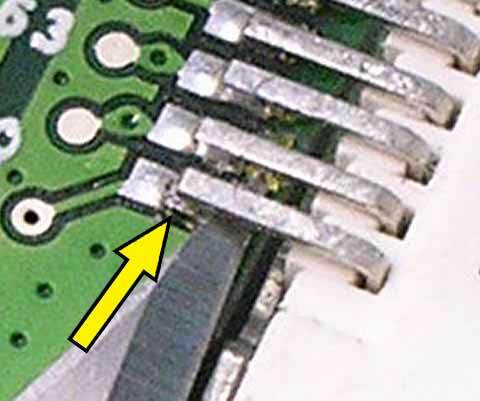 The yellow arrows shows the break of the soldering. Now a little drop of soldering. 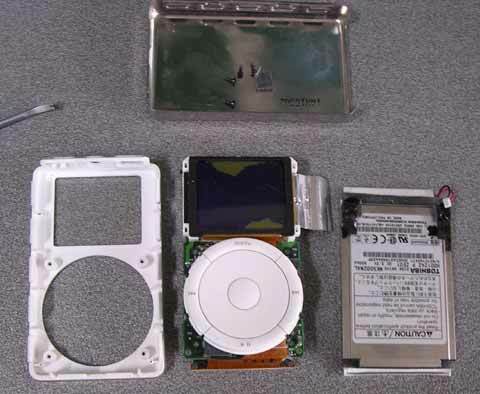 We can now reassemble the Ipod doing everything we done to deassemble but, reversely. And now, the Ipod mount each time on the desktop, with OS 9 as well as OS X. I took this opportunity to install a basic OS 9 & X, as well as repair utilities and two GB of music that I listen to randomly. "I looked carefully your document on the Ipod. 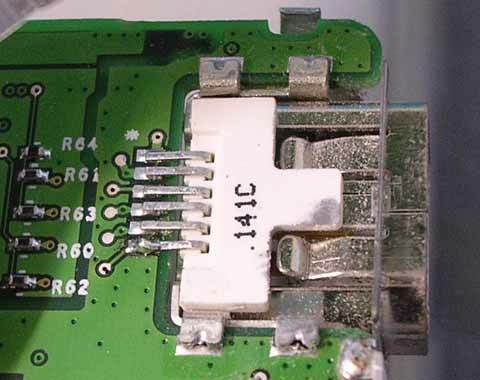 Ok, for the pin soldering, but it seems that the 4 others latches soldering are in bad condition as well, I think this would be better to repair them, as this is where it had to be strongly soldered. I reopened the Ipod and did the soldering again, well done as shown by the blue arrows, at little too hot as shown by the yellow ones. 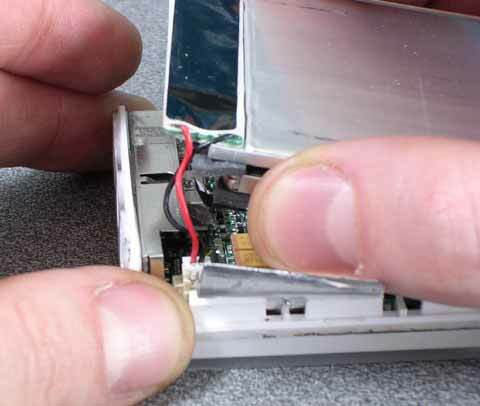 Here above, you can see the unusual tools used to open the Ipod. 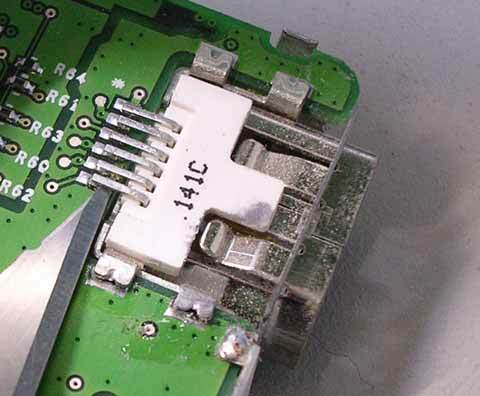 (the one above leaves no trace), this too is also used to remove components when unsoldering. But Ludovic Lange says that this is possible to open it with 3 guitar plectrums. As I don't play this intrument (or any other), I did no make the try.